' the Woodlouse: Nearly there! 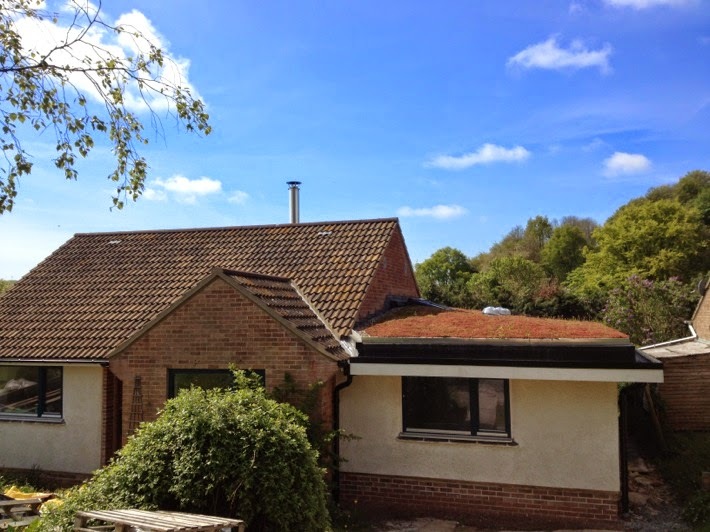 In three weeks time we'll be moving in to the strawbale-externally-insulated 1960's bungalow and loadbearing-strawbale extension that's dominated our lives for the last two years. It won't be completely finished, but will be pretty close (I write this with a startled, bewildered, and frankly disbelieving expression on my face). Having given notice to move out of the bungalow we've been renting, the 2nd June deadline is pretty final. 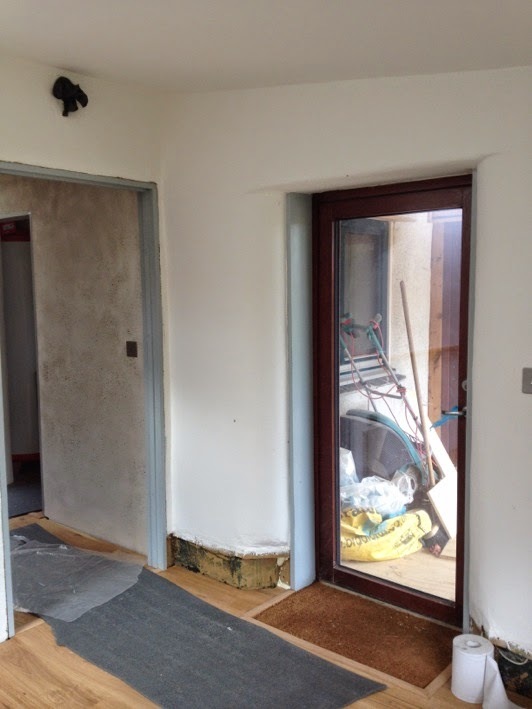 All being well, by then the bathroom will be fully functional, internal doors will be hung, the path up the side of the property and ramped access to the front and rear will be finished. Most things are already painted, the kitchen is fitted, lights are working (and I'm just beginning to remember that they are, and that on gloomy days I can make things brighter with just a click of a switch). 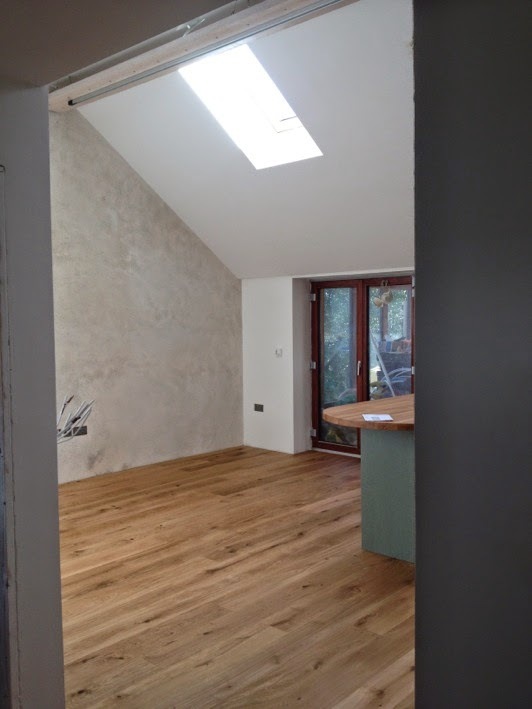 Possibly skirting boards and architraves will be fitted, possibly not. 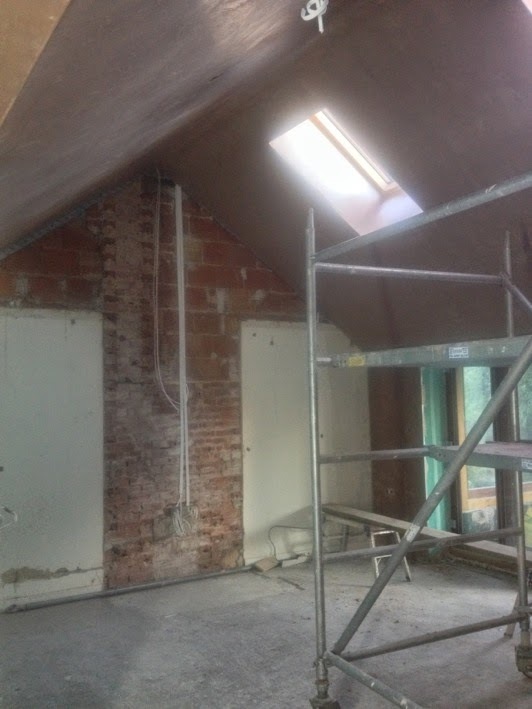 The sunroom will be completely unfinished (still need clay plaster body and finish coats, and flooring) There is also the small matter of packing and actually moving all our clobber. Thankfully Anna has been packing for a while now, doing it in short bursts when energy levels allow between the usual hospital and ongoing treatment/health-management appointments, so the remaining packing shouldn't be an epic task. I've even finally faced the piles of paper that were crowding out my desk, so for the first time in a while I'm writing this with clear space either side of the keyboard. 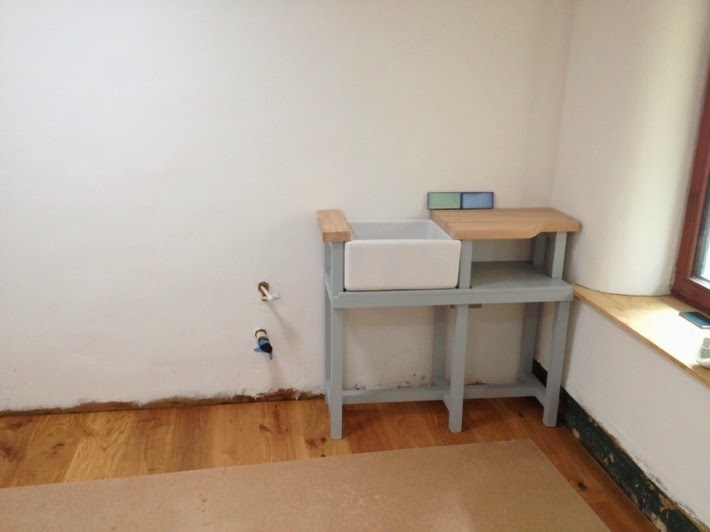 I think there are a few blogs I'd like to write about different topics thrown up by the build, but they'll have to wait now until we're in and unpacked. If I'm really unlucky they'll also have to wait until I've completed Jury Service - I got a jury summons last week asking me to start (with uncannily bad timing) on the day we have to clear the rental bungalow. Obviously I have asked to defer this until later, fingers-crossed that the Jury Central Summoning Bureau will be kind! 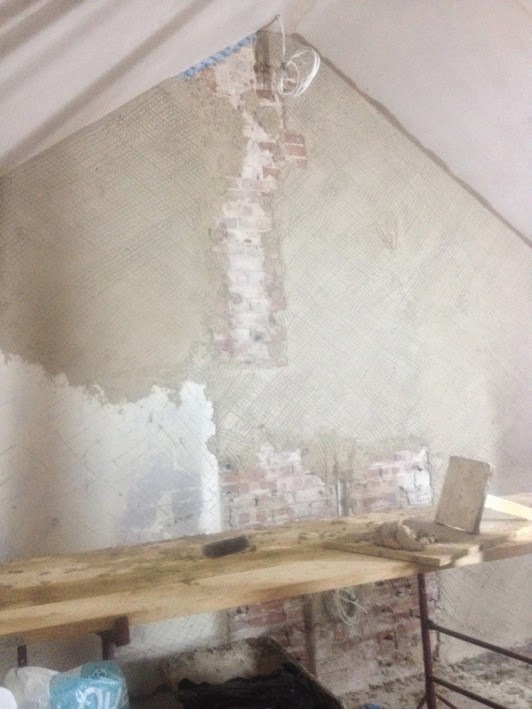 Freshly plastered ceilings in the big room, end wall still exposed. 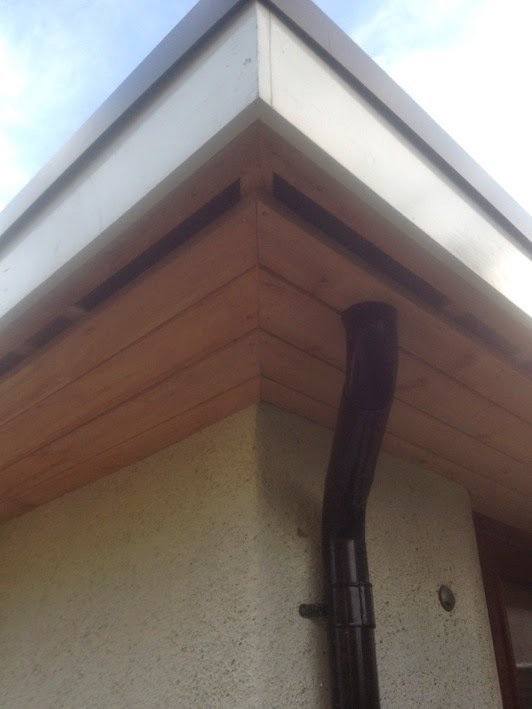 Cedar cladding in the soffits, Thanks to Darren (brother-in-law) for doing this. 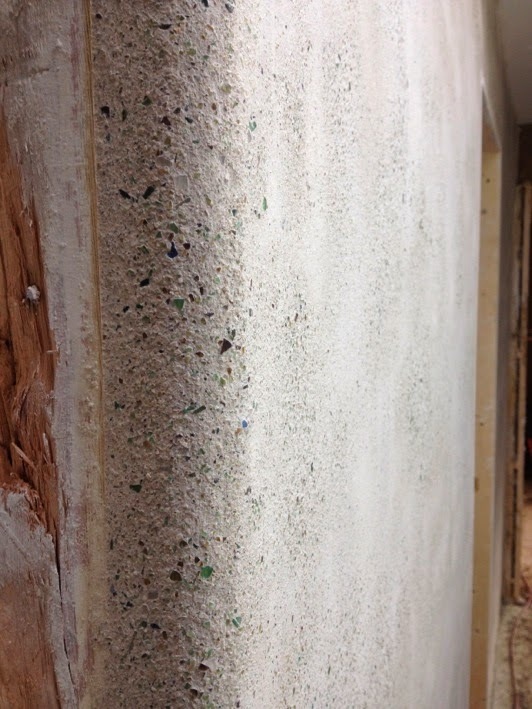 Lime and recycled glass-aggregate (Glaster) finish coat going on. I paused for a quick lunch at this point, and the join between before-lunch and after-lunch plaster is still faintly discernible. 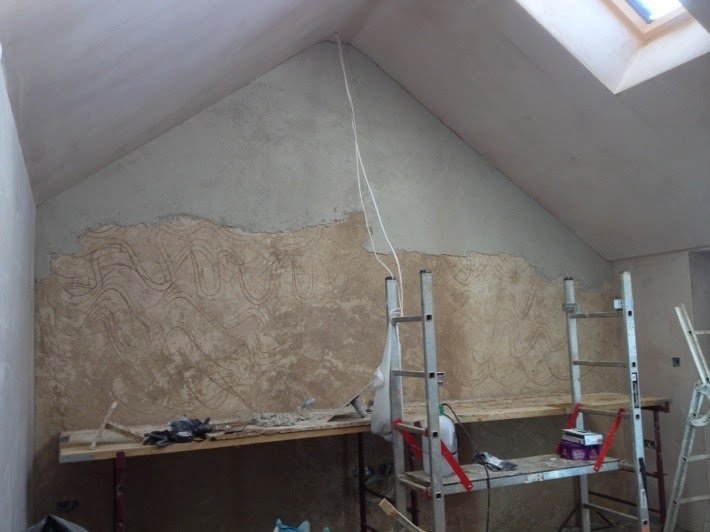 I love the look and feel of wet lime plaster covering the base coats. Pavatherm Forte wood-fibre insulation boards - first layer of insulation on top of existing concrete slab in the old bungalow. 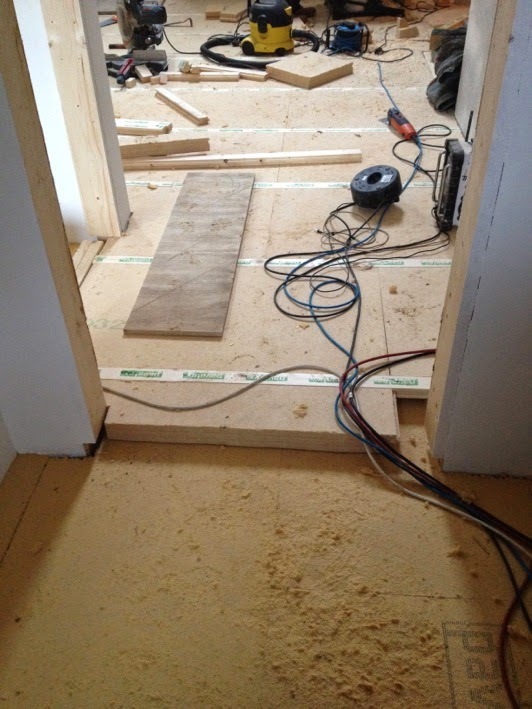 Pavatherm Profil wood-fibre boards, tongue and groove with interlocking battens - second layer of insulation and the battens provide a fixing point for the timber floor on top. 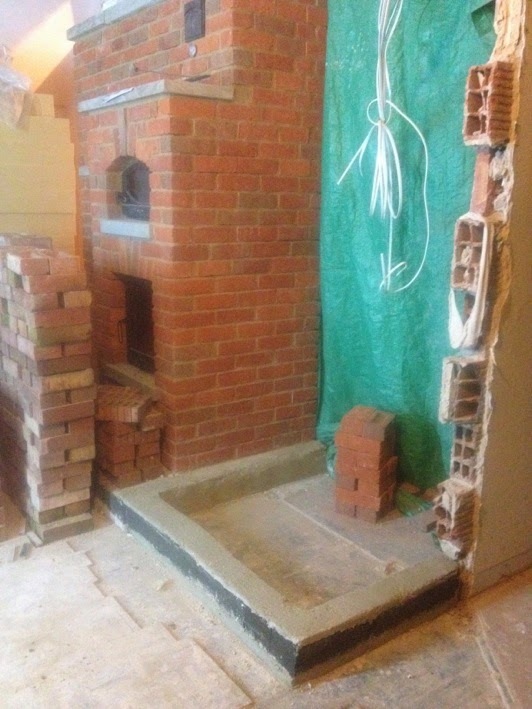 Finished pavatherm wood-fibre insulation layer, with masonry stove in the back. 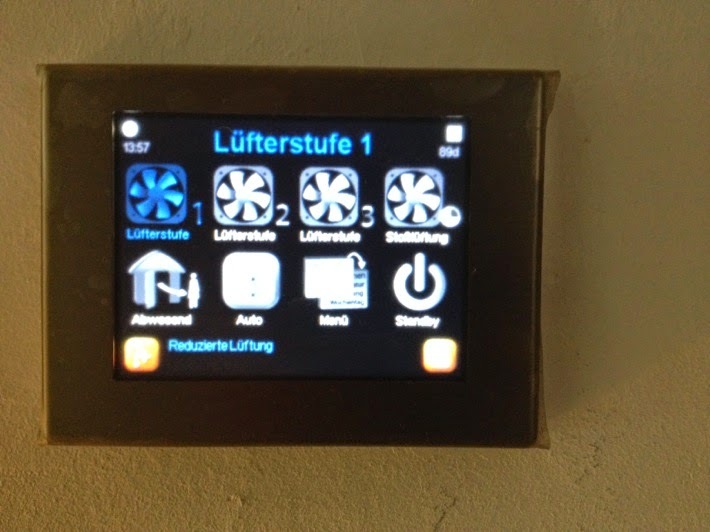 MVHR (mechacnical ventilation with heat-recovery) control panel, trapped in Deutsch until we get the secret access code to change it. I can understand fan speed 1, 2 and 3, and standby in any case. The pictures help. 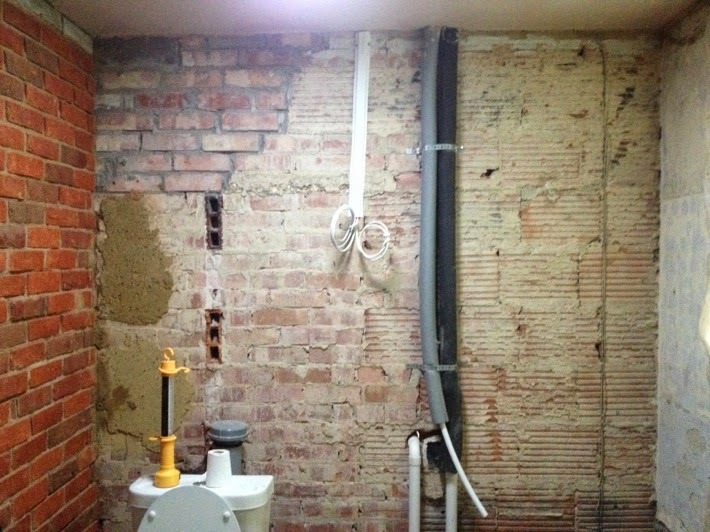 We had it running for a while to deal with the incredible amount of moisture from all that clay plaster. It massively reduced the humidity. Now turned completely off and sealed again to prevent dust from sanding doorframes etc. getting into it. 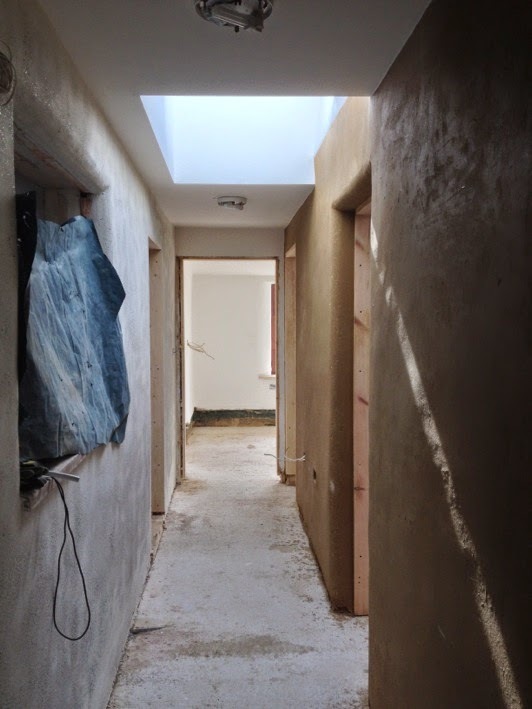 More recycled glass lime plaster in the corridor, on what was the outside wall of the bungalow. 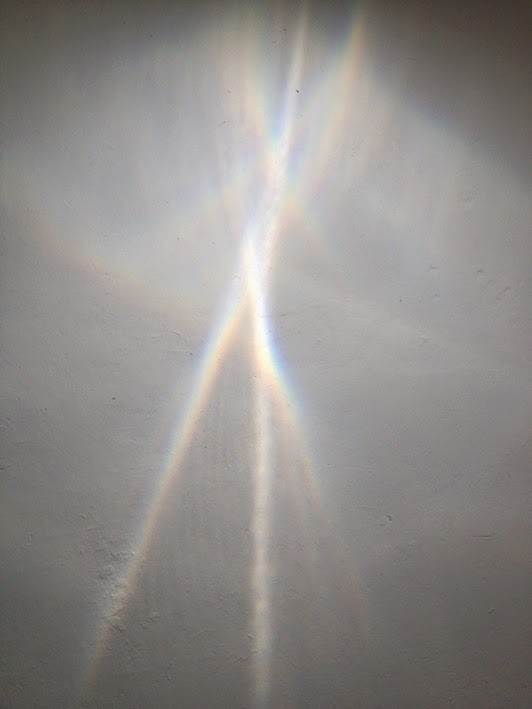 Any chance to crowbar in another curvy window reveal, especially with a bit of sparkle. 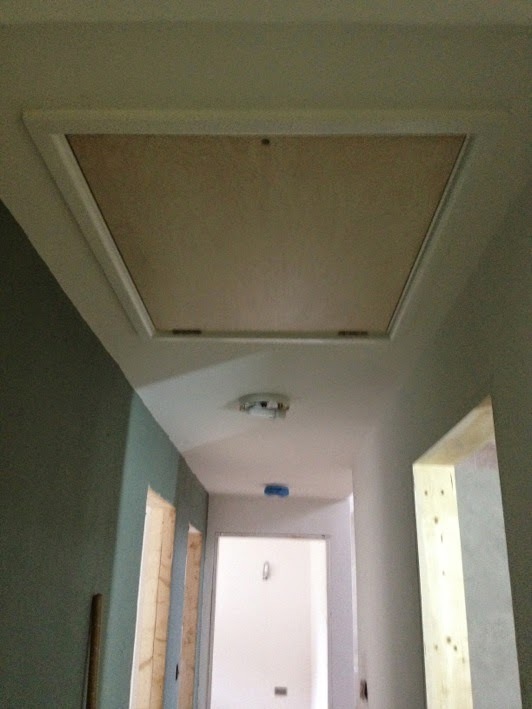 Dull but very important - loft hatch with airtight seal. Again, thanks to Darren for making it. 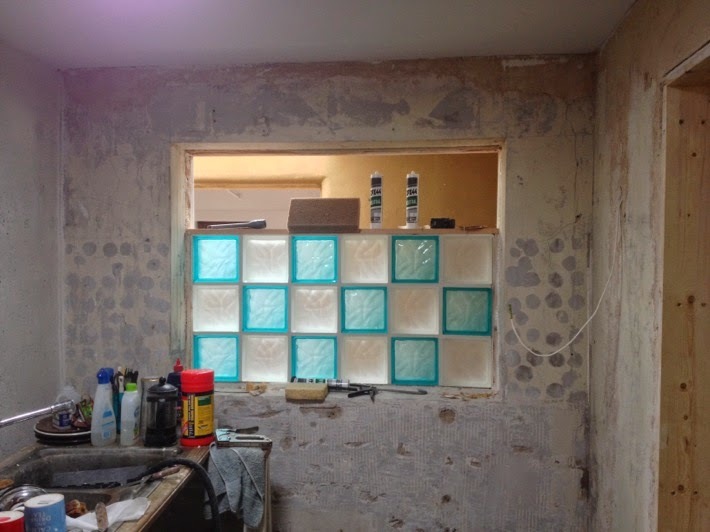 Shower wall also plastered with lime/glass, but with extra pozzolan added to make it more hydraulic (ie: stronger and waterproof). We will treat this wall with a breathable waterproof coating to protect it from soap etc.). Bathroom floor insulated with foamglas. We (I...) messed up here. 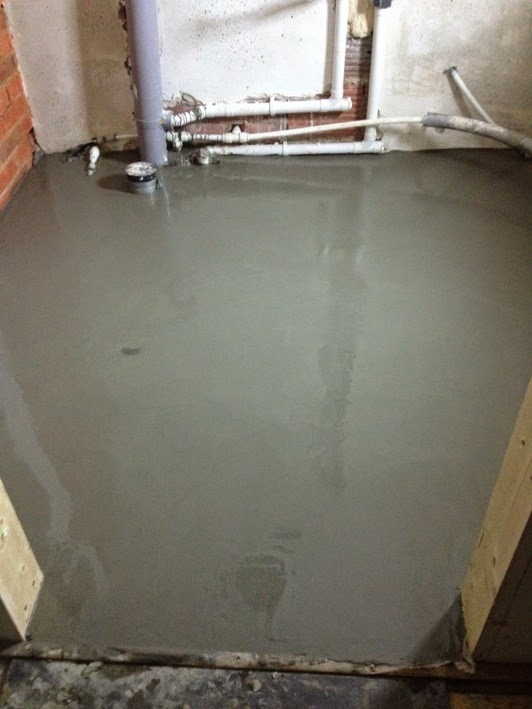 This seductively shiny smooth surface is self-levelling floor screed, very much cement based. I have to admit it was really lovely to use, flowing beautifully to create an even, level surface. 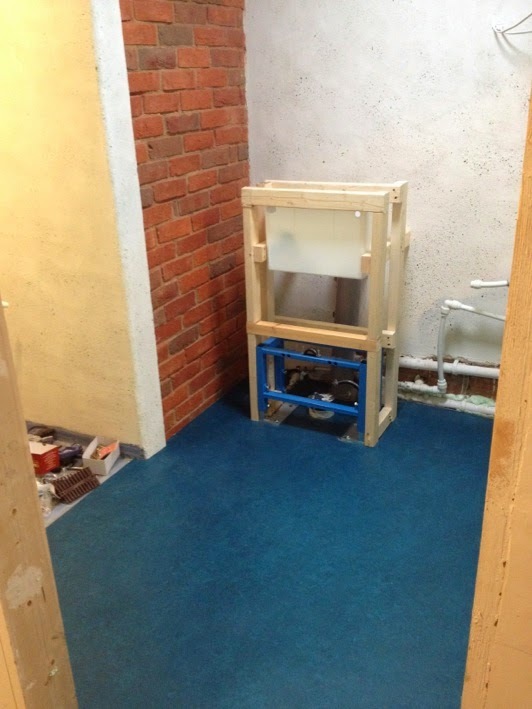 We chose Marmoleum (lino) as it is hard-wearing, waterproof and highly-sustainable (according to the manufacturers it contains 43% recycled content, and all but 3% of the rest is 'natural' materials, most of which are renewed within 10 years, it is 100% biodegradable, and has a very long service-life). 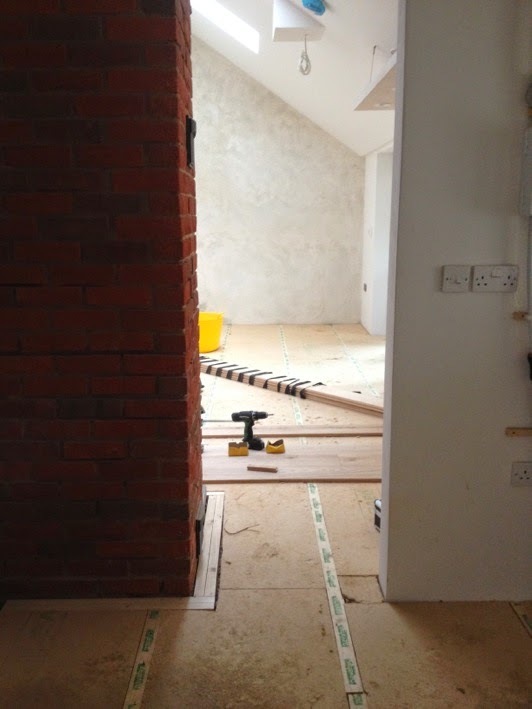 It needs to be laid on a perfectly smooth surface - they specify latex/cement screed. 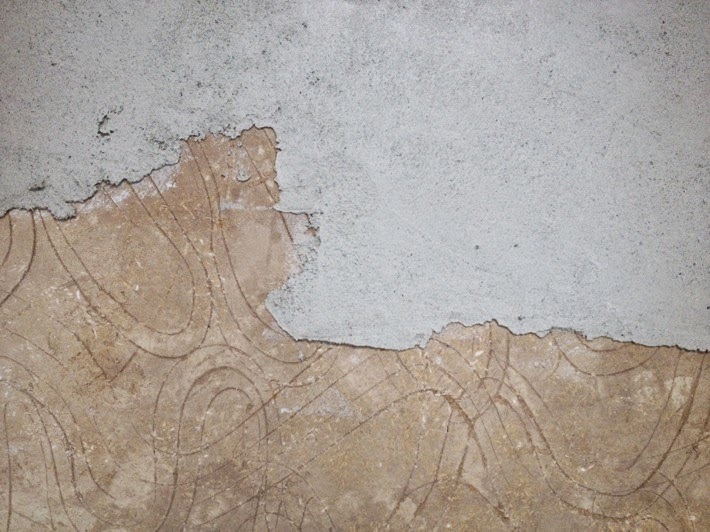 We probably could have found a suitable alternative (possibly gypsum screed?) but went for the standard option without thinking; so in order to use a wonderfully sustainable product we used a highly polluting one. Doh! Can that really be flooring going down, in a nice clean space? It's engineered oak flooring - Forestry Stewardship Council (FSC) certified plywood with 5mm of solid oak permanently glued to it. It's not as sustainable as solid timber due to the glue used in the ply (which usually contains formaldehyde) and not our first choice but we were sensibly advised not to risk solid timber. 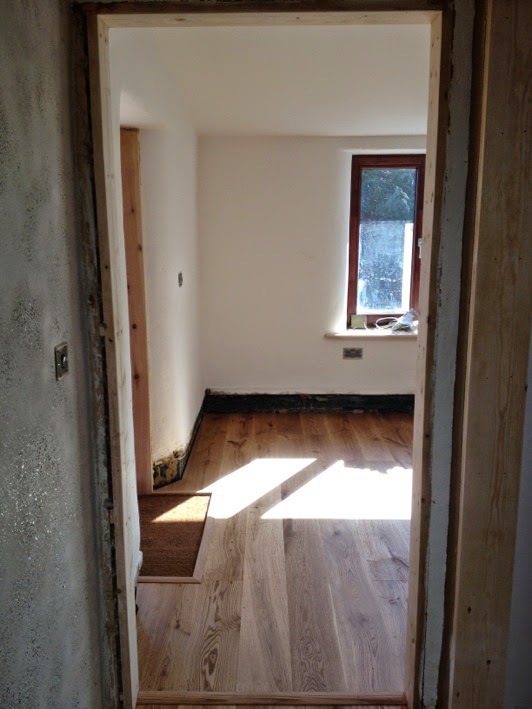 The risk of solid timber warping and cupping was too great given that the floor insulation is floating (not physically fixed to the concrete slab beneath), and because there was still a lot of moisture in the bungalow. 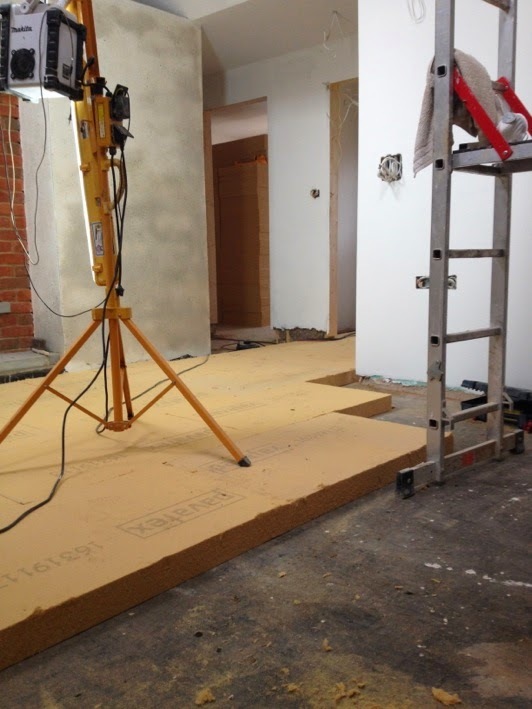 Engineered flooring is much more dimensionally stable. 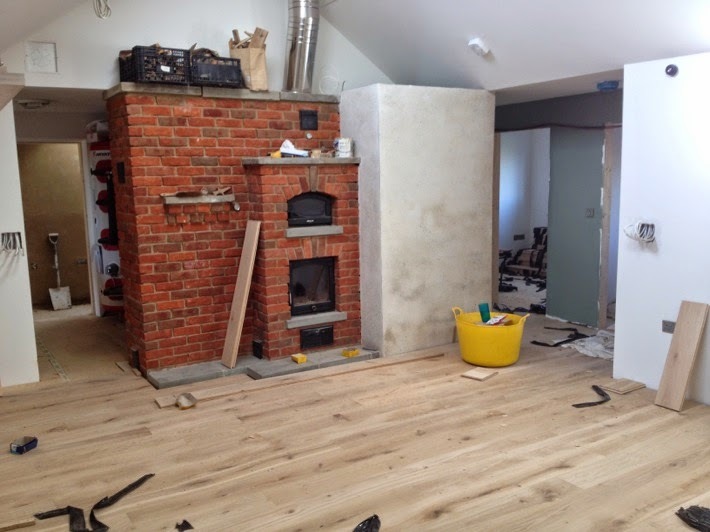 all flooring supplied and installed by the excellent Bridport Timber and Flooring. Clear, cleaned and ready for floor phase 2. 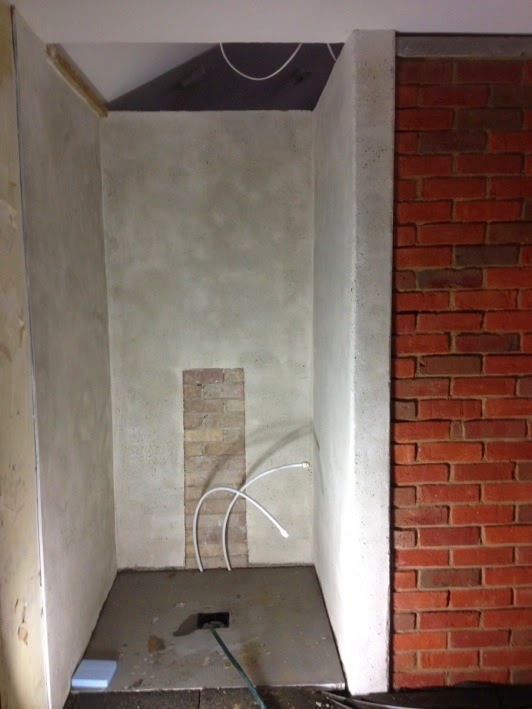 Lime/glass plaster to the left, clay to the right. 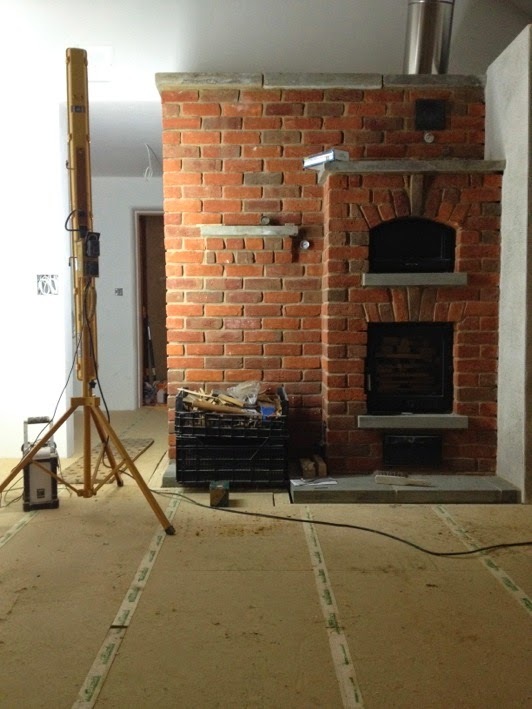 Here in the extension the floor is insulated beneath the limecrete slab, so the flooring is laid on timber battens fixed to the floor. Finished floor, with mat well, in the main bedroom. 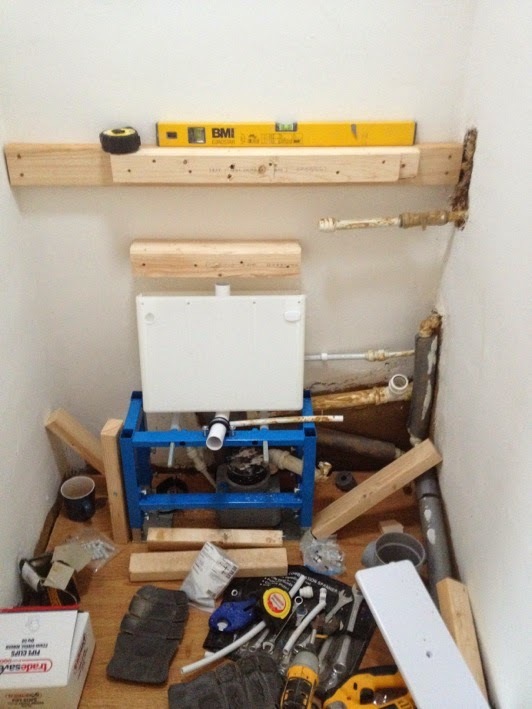 Finally, after relocating the old toilet and kitchen sink innumerable times, in order to maintain toileting and tea/coffee facilities: some permanent plumbing is under way. 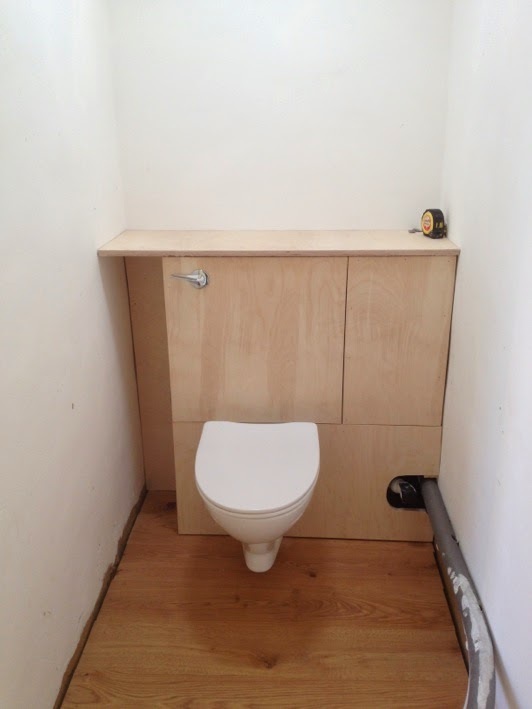 And there it is: an actual, proper toilet, in its final location. Ifo ES4 WC from the Green Building Store - most modern loos with valve (push-button) flushes are very prone to leaking and wasting water. This has a very efficient 4 litre flush, with a leak-free and reliable syphon. Flushes well using very little water, and won't waste water through leaks. Holding the flush handle down gives a short flush of just 2.5 litres. And it's supplied by rainwater. 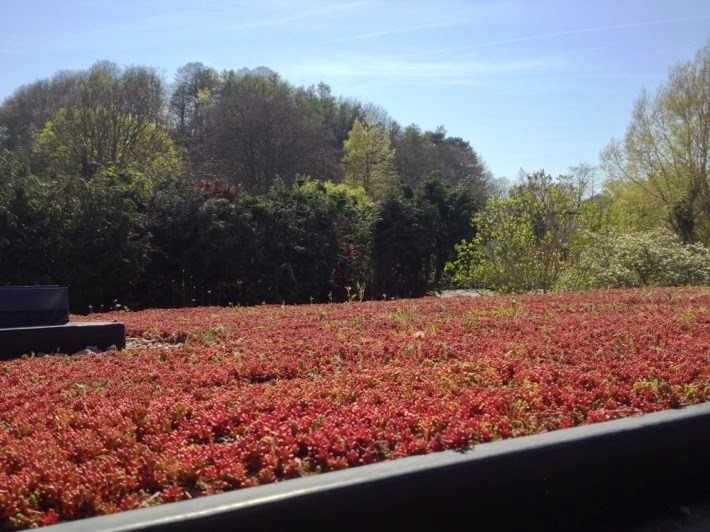 The sedum and herb roof has come to life. It's really exciting seeing it change colour and start to grow. 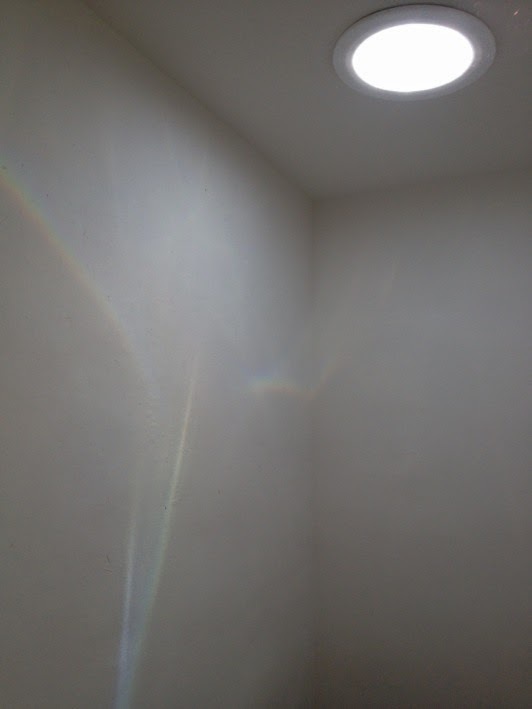 I really do love those solatube rainbows. 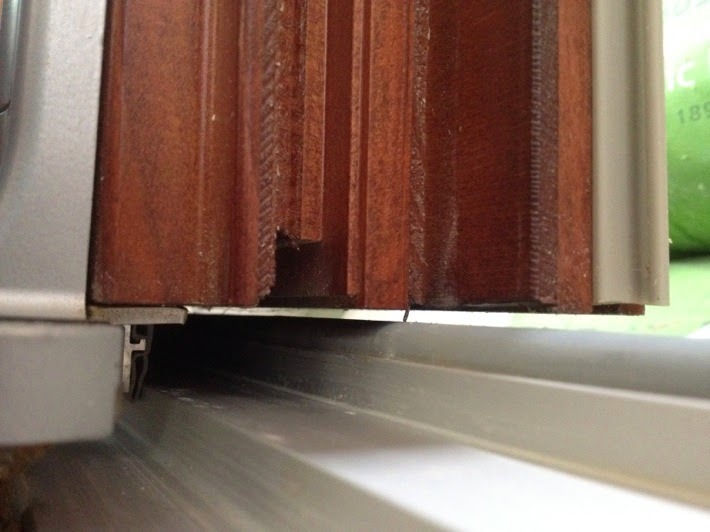 The reason this door leaked so much in the airtest (see http://thewoodlouse.blogspot.co.uk/2014/03/airtestightness-test.html): it sits about 3mm above the primary airseal. 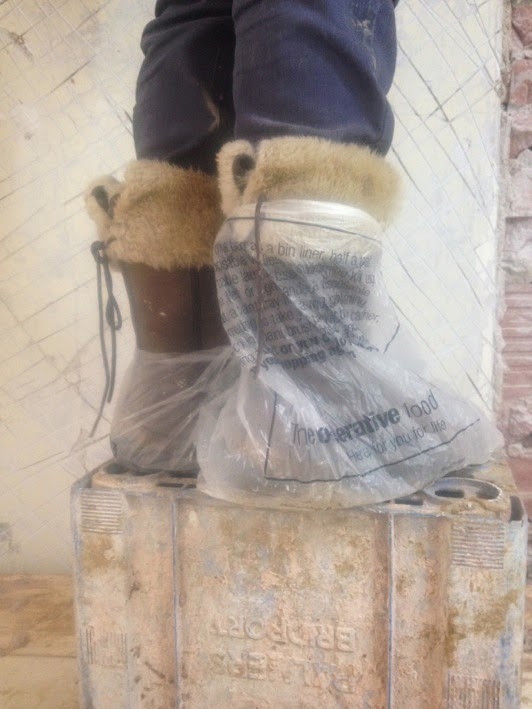 We're hopeful it can be adjusted down to sit on the seal and massively improve airtightness. 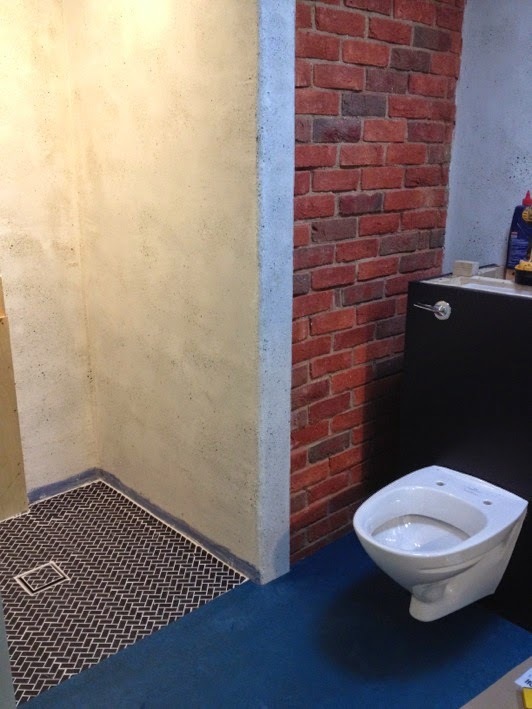 Proper loo number two, with the fine Marmoleum linoleum flooring. 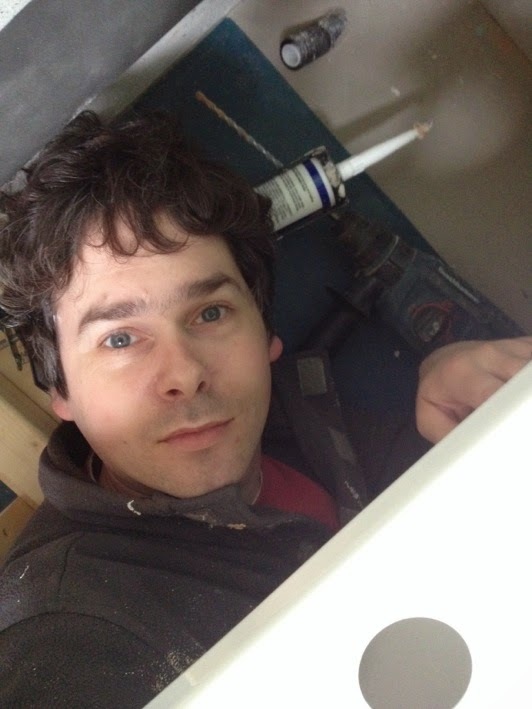 A selfbuild selfie for National Selfbuild Week. A familiar position (in an awkward corner - in this case under the shiny new bath - with tools). Note mystery pipe to nowhere in the top righthand corner of the photo. Every home should have one, to puzzle future folk. If you look at it from just the right angle, it's possible to ignore the building supplies bags and pallets. Looks alright I think! Given its setting in a row of four identically-built bungalows I like that it still fits in. Painted woodwork (colour: Nellie, as in The Elephant).